Dog Friendly Road Trip: Is Your Dog Safe Riding in the Car? 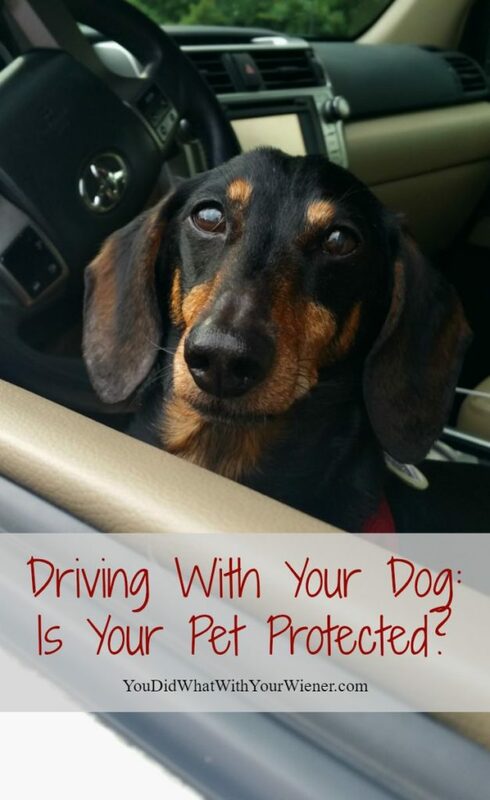 You are here: Home / Road Tripping / Dog Friendly Road Trip: Is Your Dog Safe Riding in the Car? I take Chester and Gretel with me in the car a lot. In 10 days Gretel and I are driving from Seattle to Salt Lake City for the Outdoor Retailer Show. What if I got in a car accident? The dog’s safety is always on my mind when we take long road trips but, really, it should be every day. The fact is, 52% of reported crashes occur five miles or less from home and a whopping 77% occur fifteen miles or less from home (Source). There are two main hazards when you drive with pets in the car. What Are the Hazards of Driving With Your Pet in the Car? Hazard #1 is distracted driving. A pet that is allowed to roam freely in the car – jumping from front to back seat and into your lap – can distract you from the road and cause an accident. When Chester was a puppy, and I started taking him everywhere with me, he used to ride in my lap. It was so cute to see him curled up down there and he really liked being close (well, ON) me. He got older and bigger. He’s one smart dog and it literally took me a day to train him to stay in the passenger seat. My problem was solved… for the time being anyway. He was happy to ride copilot and never tried to jump into my lap while I was driving. However, he did fall onto the floor, or hit the glovebox and then fall onto the floor, a few times when I had to brake hard. Luckily nothing was hurt except his pride those times. But what if I had been going faster or it had been a real accident? Enter hazard #2 – getting injured from flying around the car if I had to slam on the brakes or crashed. I wanted a solution that would both keep Chester and Gretel from running around the car AND keep them strapped into the seat if there was an accident. I got a Snoozer Lookout car seat. The seat can be buckled in using the car seat belt and then a strap loops around that and ties to their harness. Problem solved again… for the time being anyway. That was almost 6 years ago. Since then, people have learned more about pet safety in car crashes. While the car seat we have, and many on the market like it, are sold as pet “safety” devices, they really only address the first safety concern – distracted driving as a result of a pet running around the car. The Center for Pet Safety has tested a lot of harnesses, dog car seats, and carriers to see what would happen in a crash. 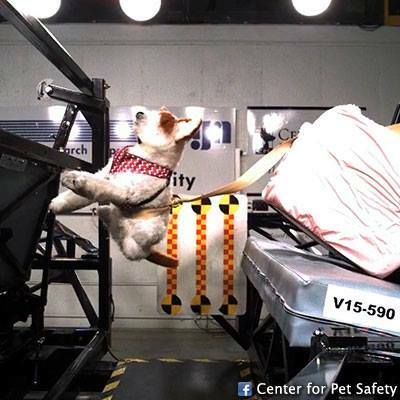 The Center’s Certification Program is the first formal crash test rating system for carriers and other pet safety restraint products. Additional information about the Center for Pet Safety and its Certification Program may be found HERE. So… yeah… that car seat that we have? Watch what happens to the 25 lb. Terrier Test Dog in a crash (It’s a stuffed dog) HERE. Now, the Center for Pet Safety says they used the car seat exactly as recommended by the manufacturer but the harness they use is different than mine and I don’t wrap a seatbelt around the dog’s waist (not sure why they do that but it’s in all their car seat crash test videos I’ve seen). I want to believe that Chester and Gretel would be safer the way the seat is set up in my car but I am pretty sure I’m just in denial. When most people see that product to restrain your pet when riding in the car is labeled as a “safety” device, they assume it will keep their pet safe in a crash like a child safety car seat. That’s not necessarily true. To say that these companies are being misleading would be a bit harsh. Many of the safety claims or ratings are based on mechanical strength tests performed on the materials used to make the item. Wouldn’t you want them tested on a real pet in a real crash scenario though? I know that I am giving our current car restraint system a serious second thought. There are a few companies that have worked with the Center for Pet Safety to perform actual automobile crash tests on pet safety products. Subaru, the car company that loves dogs, has funded many independent studies. One company, Sleepypod, takes pet safety seriously and has funded a lot of studies on their own products. They even had their own crash test dog and cat dummies made! Sleepypod understands the importance of pets in their owners’ lives and that’s why safety is Sleepypod’s top priority. To protect the joy of driving with pets, Sleepypod crash-tested its entire line of dog safety harnesses and pet carriers at the standard set for child safety restraints. The Center for Pet Safety awarded top honors to every Sleepypod pet carrier organization’s new carrier certification program. The test protocol, which is a result of the 2015 Carrier Crashworthiness Study conducted by The Center, and sponsored by Subaru of America, outlines a consistent test methodology and evaluation program to ensure pet carriers offer crash protection. 5 Star Crash Test Ratings were awarded to the Sleepypod with PPRS Handilock, the Sleepypod Mini with PPRS Handilock, and the Sleepypod Atom. The Sleepypod Air pet carrier earned a 4 Star Crash Test Rating. Note: some of the product links in this article are affiliate links. That means when you click on a link and make a purchase, I will receive a few pennies to help maintain this website. Knowing what I know now about pet safety in car crashes, what have I done? Truthfully, nothing yet. I’m going with the “what I have will keep them safe when I brake hard and minimize distractions” and crossing my fingers that we don’t get in a real accident. Like I said though, it IS really on my mind. The problem for us is that I haven’t found the perfect solution. Chester and Gretel like sitting in their car seat so they can look out the window. I like being able to look over and see their puppy dog eyes looking back at me. The crash-tested harnesses out there don’t fit them properly (I think. Sleepypod sent us the Clickit Sport Harness to try and it seems to big for Chester and Gretel but I’m still trying to make it work. It would fit a larger Dachshund fine by the way.). I’m still looking and thinking. I’ll come back here an update when I get it figured out. What do you use to keep your pet safe in the car? I have had the Sleepypod carrier since it came out. It is definitely the best one on the market. I recommend to everyone. Some people have complained about the price but it is worth it. Cuba loves his travel house and does great in it on the plane! We have the Sleepypod air and I love it for flying with Gretel. I know they work in the car great. However, I don’t like not being able to see/pet the dogs and I am sure they would not like being confined and not being able to easily see me or look out the window. I have my dogs in kennels in the car. I recently upgraded to a van, which means I have a bit more room, and I set it up so I have a bed on top of a row of kennels (I like being able to camp in the van easily, so keep the bed set up all the time). The kennels themselves are not crash tested ones, and I’d like to replace them with kennebec or rough tuff kennels when I have the money to do so. But for now, my dogs ride as safe as I can make them. That’s kind of where I’m at too – safer but not the safest. I’m hoping the perfect solutions comes along for us soon. That looks like a great harness and I would also believe it’s good if the Germany tested and approved them. That’s so cool that they require dog restraints over there. As I said, I used to drive with Chester on my lap. Now, when I see other people doing it, I cringe though. It’s always a challenge for me to find ones small enough for my dogs so there may be the same issue with this one too. The other thing is the Dachshund’s pointy, prominent breast bone. It either pushes the chest strap to one side so it doesn’t fit properly and/or I worry that the pressure direly on the breast bone in a crash would snap it. Where are my Dachshund-specific crash tests?1? Ha, ha. I must be the only person that does not like the Sleepy Pod Air. And yes, Montecristo’s safety is really important but: 1) he gets car sick. A carrier is not an option because he needs to be able to look out the windows and feel the AC on his little face. Yes we changed car so the rear had their own AC so he could have his own supply. 2) I want to be able to see him and keep an eye on him because …. he gets car sick. I want to know the moment he needs a break and I can’t if he’s in the carrier. So like you – we have the best possible harness and his booster seat so he can look out and not get sick. Safer but … not safest. I don’t use the Sleepypod Air for car travel. Most people I know that have one don’t. It IS a safe option though since it’s been crash tested and approved. I won’t use it in the car for similar reasons as you. Our family cat also used to come on trips with us at time, and while he got comfortable, he did topple over a few times too. I was always really worried for him, so I can definitely see why you’re concerned. Great post. Because the dogs would already be laying down already what I like to do with my dachshie is seatbelt his crate on the passenger seat. That’s definitely a great solution to keeping him from running around the car. I’m just trying to make people aware that those types of measures may very well not keep their pet from getting injured in an accident (if the crate carrier has not passed a crash test by the Center for Pet Safety). I’ve been wanting to get some harnesses for the dogs when they are in the backseat of my car. Dante freaked me out once by managing to step on the window button and next thing I knew his whole front half was practically hanging out so that he could get a better view!! Of course my window rolling all the way down doesn’t help the matter, but going 55 mph on a country road that was scary! So after that I child locked the doors and windows just in case, and most of the time now I have them in the very back of my toyota rav with a cage keeping them from hopping the seat. It keeps them contained, I can have the windows all the way down without worrying about them jumping out, and they can easily lay down and sleep which is what Ziva likes to do. Chester and Gretel have done that too – stepped on the window button. They are strapped in but their car seat puts them high enough so still fall out of an open window. I usually keep my window locks on now too. One thing people do may not realize is that IF you are in a serious crash and IF your dog even survives it, the car may be damaged in such a way to allow the dog to escape if his seatbelt harness or crate failed in the crash itself. I read of a bad accident with a show handler having multiple dogs end up loose on a major highway. I don’t recall the outcome, but certainly that could be deadly. If you visit the Center for Pet Safety’s website and watch the test videos, you will see that many harnesses fail and many crates literally disintegrate when faced with the pressure applied in even a lower speed accident. I don’t know if they ever did any studies on what happens to dogs loose in the rear of an SUV with a barrier. I guess that would depend upon the distance from the barrier at the time of the crash and the weight of the dog. I don’t know if the barrier would break, or how badly the dog would be hurt, but certainly if the tailgate popped open in the accident then they would be free to zip down the road. Perhaps the Center for Pet Safety would consider a video on pet barriers as many use them. Yes, they can’t be protected in every scenario. If the crash is that bad, sadly, the people might not survive so the dog escaping will be the least of the family’s worries (at the moment). This blog is post is exactly about what you reference – the Center for Pet Safety’s crash tests showing that many harnesses do not work to restrain a pet in a major crash. That’s why I listed the harnesses and crates that DID pass their crash tests. I don’t imagine that they would be doing crash tests on what would happen to a dog in the back with a barrier. The CPS is more concerned with keeping a pet UNHARMED rather than merely inside the car. No matter what the crash was, a dog loose in the back would bounce around and could be injured. I’m glad to see that you are really thinking about this issue. I wish more people did. Although we are aware of the dangers we are still relying on harnesses & the vehicle seatbelt’s system. You have both me & my huMom re-thinking this issue though, thank you. Me too. Part of me thinks – “If we are in that bad of a crash, we are kinda screwed anyway.” Ha, ha. I would like to switch to a crash-rated harness but haven’t found any that fit my little dogs well. But, like you, the issue is always on my mind. I tried both the Sleepypod harnesses and just did not like them. I found them hard to adjust and my dog, Clancy, was in-between sizes. I tried mightily to get some assistance from Sleepypod and they only repeated back to me what was on the Intranet. The Center for Pet Safety has not tested harnesses for a number of years and there are other options out there. Kurgo pulled their failed harness and now has crash test reports and videos on their website. I am using the Kurgo Impact harness for the car and really like it. I sometimes use their enhanced strength true-fit harness — which is also crash tested. Clancy is 70 lbs. I considered crate but he likes to be in the middle seat and is annoying in the back so I went with a harness. I’m glad you found a crash tested harness that fit your dog. The Sleepypod Clickit Harness was tested in 2013 when the Kurgo harness that did “not meet performance requirements” was also tested. It’s nice that Kurgo tried again with a new harness and new crash test (looks like 2015?). Although the test wasn’t performed by an independent third party, I wouldn’t suspect them of “rigging” the test to be in their favor. They are both great brands and the fact that the company even cares about real crash tests goes a long way in my book. We use sleepy pod to transport our cat around. It really helps to calm a nervous cat down.